OCCC work furlough inmate Travis Massey fails to return to facility after work. Sheriffs and HPD notified. If seen, call 911. Work furlough inmate Travis Massey failed to return after work to Module 20 at the Oahu Community Correctional Center (OCCC). He was scheduled to return at 3 p.m. State Sheriffs and Honolulu Police were notified. Massey is 35-years old. He is 5’9” and weighs 185 lbs. He has brown hair and blue eyes. He also has a tattoo on his throat that says “Thy will be done”. He is serving time for Burglary 1 and 2, and Unauthorized Entry into a Motor Vehicle. His next parole hearing is scheduled for January 2018. 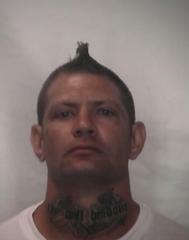 Massey is a community custody inmate in the work furlough program. Inmates in the work furlough program are either actively seeking employment or working in the community. Community custody is the lowest classification status. If you see him, please call 911 or Sheriff Dispatch at 586-1352.